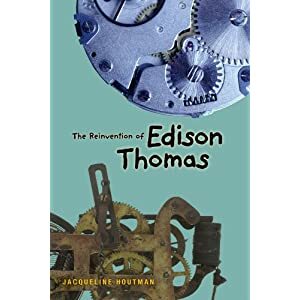 Edison Thomas, aka Eddy, is not quite like everyone else. He worries about things. He’s really, really smart. He doesn’t understand a lot of social cues. He gets made fun of and doesn’t understand who his real friends are. But he’s such an endearing character and, thankfully, he’s figuring things out . . . . Now, here’s a chance to figure out a little bit about Eddy’s author, Jacqueline! Kathy: Tell us why we should buy this book. Flip answer: So my publisher will do a second printing and I can correct the errors I found in the first printing. Serious answer: So you can get inside Eddy’s head and get to know how Eddy—and other kids like him—see the world. And when you’re done reading it, you can give it to somebody else. Kathy: You have the chance to give one piece of advice to teen readers. What is that? Jacqueline: Try to read things in a variety of subjects and genres. You may discover new favorites among books you didn’t think you’d like. It’s not all about vampires. Kathy: What’s an important “nugget” that you’d like readers to take away from your book? Jacqueline: Great minds don’t all think alike. Kathy: Why do you write for young people? Jacqueline: I write what I would like to read. I’m especially fond of middle grade fiction. It’s such a profound time of life, standing there on the precipice of adulthood. Figuring out who you are and where you fit. I’m still trying to figure it out, myself. Kathy: When do you write? Jacqueline: Whenever I can find the time. Big chunks of time, though rare, are especially productive because it takes me a while to get immersed in the story. Kathy: Where do you write? Jacqueline: There’s a coffee shop a few blocks from my house. I’m there so often that I’ve gotten calls there on the shop’s landline. Kathy: How do your ideas come to you? Jacqueline: My mind works a lot like Eddy’s, in that certain experiences will set of connections with facts and memories in my head. A lot of it is unconscious, and I find that while I’ve been off doing something else, like writing for grownups on a deadline, the story has been writing itself in my head,. Kathy: Do you have a favorite quote or bumper sticker? Jacqueline: “Never take no cut-offs and hurry along as fast as you can.” Virginia Reed, a survivor of the Donner Party said this in reference to her disastrous westward journey, but it applies to many other aspects of life. I had this quote taped over my desk during graduate school. Kathy: What are you working on now? Jacqueline: I’m working on another middle grade novel with a male protagonist. Like EDDY, it’s very sciency. But this one has rockets. Kathy: Tea or coffee? Milk or sugar? Jacqueline: Coffee. Decaf mostly. With chocolate milk. Jacqueline: Autumn, or more specifically, September (although most of September technically falls within summer). Garden produce is abundant, the weather starts to cool down, and the kids are back to school. Jacqueline: Deciduous trees generally have prettier flowers. Kathy: What’s always in your fridge? Jacqueline: We have an entire shelf devoted to yogurt. Jacqueline: Potato chips are my downfall. That’s why I only buy them in single-serving packs. Kathy: Food you’d rather starve than eat. Jacqueline: I tried to eat raw oysters once. It wasn’t pretty. Jacqueline: I prefer cats, but I’m allergic to them. Jacqueline: Flats. Heels are impractical and uncomfortable, especially since I broke a toe last year. I’m 5’10” so I don’t need the extra height. Jacqueline: Usually jeans, except in the summer, when it’s capris or skorts. Kathy: Short hair or long? Jacqueline: Short. I’ve had it long for periods of my life, but short is so much easier. I tell my hairdresser my allotted time to spend on my hair in the morning is 30 seconds. Jacqueline: A long dinner with my husband at a nearby French bistro, followed by a walk by the lake. Jacqueline: An apartment (or better yet, a villa) in the South of France. Kathy: Favorite board, card, or computer game? Jacqueline: I play a mean game of Trivial Pursuit, but people don’t like to play with me. I also love games like Pictionary. Kathy: Favorite sport or form of exercise? Jacqueline: As a participant, my current favorite is Zumba, although I’m starting to get into yoga to try to keep my back healthy. As a spectator: The Tour de France. Kathy: Language in which you’d most like to be fluent? Jacqueline: Something like Chinese would be fun. I love the fact that different intonations change the meaning of words. Kathy: Country you’d most like to visit? Jacqueline: France (are you sensing a theme here?) or maybe Australia or New Zealand. Kathy: Skill you’d most like to acquire? Jacqueline: The ability to read books quickly. My to-be-read pile is out of hand. There are so many great books out there, but I’m so slow reading them. Jacqueline: I love the sound of the French horn, but I’d love to be able to play the drums. Kathy: Topic you’d most like to write about? Kathy: Topic you think most needs writing about? Jacqueline: Science. Scientific literacy is so crucial these days. People think they can’t understand it, and leave it to others to make decisions for them. Good science writing can explain anything to anyone. Kathy: Author you’d like to meet? Jacqueline: Kathy Erskine. Oh wait, I’ve done that. I’ve met so many amazing authors in the past couple of years. Of the authors I know I’ll never get to meet, I’d say JK Rowling. Kathy: Question you’d ask that author? Jacqueline: How do you keep all your facts organized? I’d want to have a look at her filing system, if she has one. And sneak a peek at some unpublished facts about Harry and his world. Kathy: What most surprises you about our current culture? Jacqueline: I’m amazed that people can show—at the same time—immense kindness, complete indifference, and outright intolerance. Jacqueline: The Green Glass Sea by Ellen Klages, The Evolution of Calpurnia Tate by Jacqueline Kelly,. My Side of the Mountain by Jean Craighead George, the Harry Potter books (especially in French), any kind of reference or trivia book, with lists of obscure facts. Thanks, Jacqueline! And we’ll look forward to the next “sciency fiction” book! Eddy is very enjoyable. But … chocolate milk in your coffee? Really? Ha! I’ll bet you’re ruthless!